I believe this one is called Bun Thit Nuong, it's probably one of our favorite foods to eat. 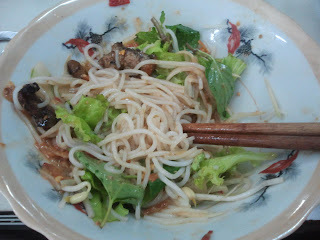 It's rice noodles on a bed of greens (lettuce and herbs), topped with some barbecued meat, some peanut sauce, and some chili sauce. You toss it all together, it usually looks nicer when they bring it to you, and then you eat it. I never thought of combining fresh greens with warm meat and noodles, but it's SO good! This next dish is called Banh Xeo, which is translated as "pancake" but not the kind you would get in the USA. 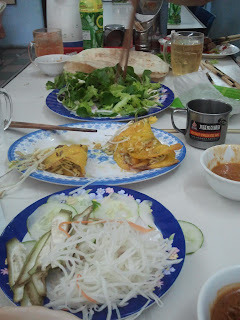 It's the dish in the biddle, the yellow one, which I thought was kind of an egg omelet thing with shrimp and bean sprouts in the middle, but according to the internet there may not be any eggs in it at all, I don't know. Anyway, here is how you eat it. It is served like above with a plate of fresh herbs (top) and a plate of young papaya shreds, cucumber, and young banana (bottom), and a plate of thin rice paper. 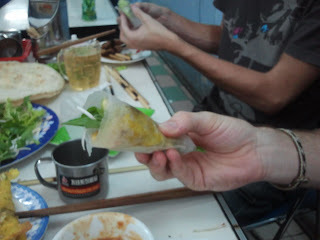 First you take the rice paper, put on a piece of the ban xeo, and top it with some herbs and some of the papaya and cucumber, whatever you like. Then you roll it up into a little greasy spring roll thing. 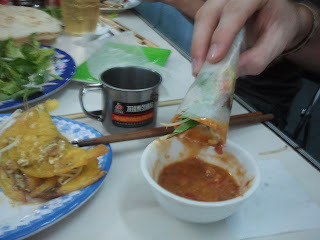 Then you dip it on the sauce, which is a kind of peanut/fish sauce blend of some sort, and you eat! After Marble Mountain, Michael's co-worker Tra and her friends were kind enough to take us out to visit some English schools to see if I could find a job. 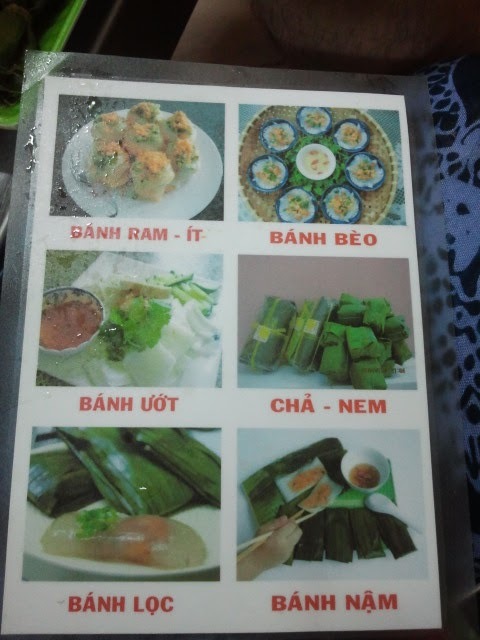 Afterward, they took us to eat the dishes on this menu, they are hard to see but it has the names. The Banh Beo is like a warm rice flour pudding dish with some fish sprinkles on top, the flavor all together reminded me of tuna casserole. 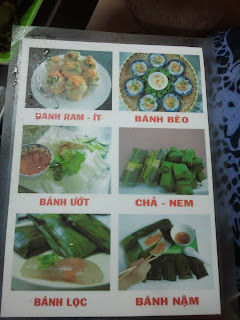 The Banh Loc was a kind of gummy rice flour dough surrounding a piece of shrimp and cooked in a banana leaf, and the Banh Nam was something like a layer of rice flour dough with fish on top, also steamed in a banana leaf. 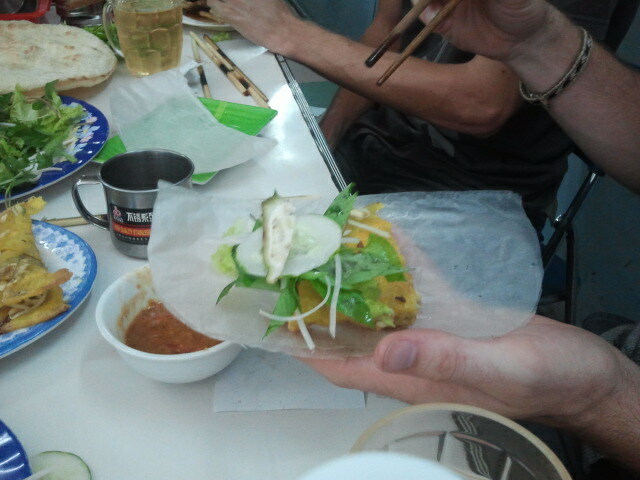 It was really good, but a very different texture than we are used to back home. Then, Michael was talking with them about foods he would like to try sometime, and they decided that it was time he tried Hot Vit Long, a fertilized duck egg. 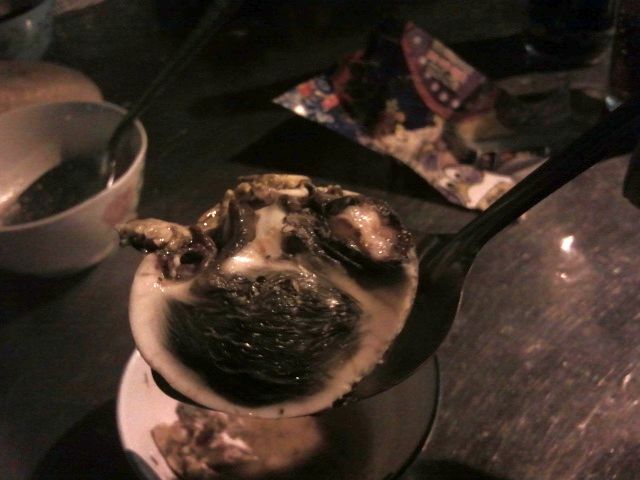 As far as I understand it is common food in this area of the world, and they told us that they ear it at night so you don't have to look at it, but it is "very good for your health". I was less than enthusiastic, but Michael really wanted to try it. WARNING - the photos are quite graphic, don't go beyond this point if you have a weak stomach! So nasty, can I just tell you? These are all served with salt to help with the flavor, and they also were sure to get him something to drink afterwards. All the while I was trying not to look or lose my dinner we just had. 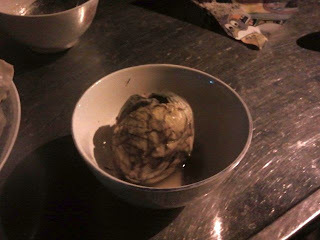 He ate the first half no problem, and then this is what it looked like inside, duh duh dunh! Yeah, SO GROSS!!! But he actually kind of liked it. He said it was indescribable, as he had never tasted anything like it and so couldn't even start with comparing it to other flavors. 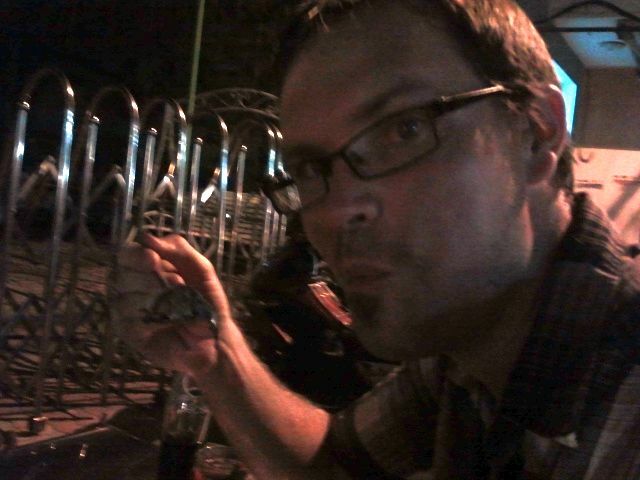 He also tried the smaller eggs and liked them too. I am married to a crazy man. At least he's cute :) And he brushes his teeth before kissing me with that mouth!